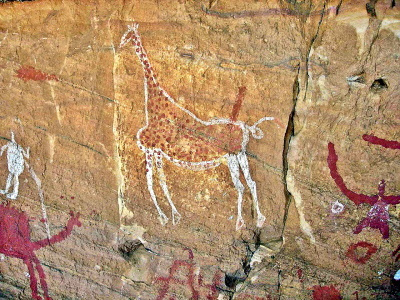 The Rock-art Sites of Tadrart Acacus hold thousands of cave paintings that reflect the way of life of different Saharan civilizations. They are located in a desert area in western Libya (part of the Sahara). It borders the Algerian World Heritage Site Tassili n'Ajjer. The paintings date from 12,000 BC to 100 AD and reflect cultural and natural changes in the area. There are paintings and carvings of animals such as giraffes, elephants, ostriches and camels, but also of men and horses. Men are depicted in various daily life situations, for example while making music and dancing. Palaeolithic and Mesolithic: The site also includes the Murzuch desert, which bears traces of the different phases of the Palaeolithic. Mousterian: "Flint tools from the Mousterian period (80,000 years ago) were recovered from hundreds of sites in the valleys of the Acacus." Mummies: The "black Mummy" - a Mummified infant was found in a rock shelter at Uan Muhuggiag in 1958. Carbon dating indicates it predates known Egyptian mummification.